September 2009 was the best month of last year for comics sales, and this September had a difficult time keeping pace. Unit and dollar sales for comic books in the Top 300 were down 14% and 12% respectively, while top-selling trade paperbacks held firmer, off only 2%. Backlist sales and sales of comics below 300th place improved the overall total considerably, although it does appear that at least some August sales were reported in September. Click to see my estimates for September 2010. The quarterly losses in periodical unit and dollar sales were the worst posted since the second quarter of 2001. However, by historic standards, there have been many tougher periods; in 1998, every quarter of the year saw double-digit losses. And a trend that I've reported on in the past appears to be continuing — and growing: Direct Market sales volume for comics not appearing in the Top 300 appears to be increasing. • the average comic book in the Top 25 is selling more poorly in 2010 than in 2003. 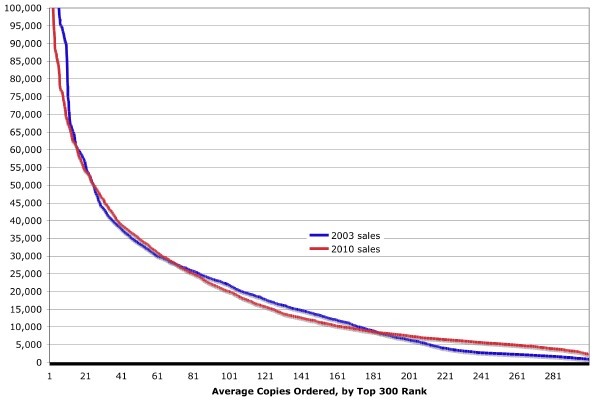 At the very top of the chart, 2010's average top-sellers are about 25% off what the best-sellers of 2003 were doing. • ...but then in the midlist, the trends turn negative. From 70th place to 183rd place, we're selling somewhat fewer comics than we used to.The low point is around 150th place, where the 150th place comic book in 2010 is selling about 15% fewer copies than the same point on the chart in 2003. • But then, the numbers go to Mars. Beginning at 184th place and all through the 200s, comics today sell more, and often, dramatically more copies than they sold just seven years ago. The gap may not appear big in the graphic, but it is enormous, and it grows as the list goes deeper. (Look at the difference more closely, at right.) By the 235th place comics, today's books sell double what they did in 2003! It's almost triple by the time we reach the end of the chart each month. That's not dollars — that's copies. It's not a one-month fluke, since we're averaging all the titles that placed at each ordinal ranking. The bottom of the chart today simply represents far more copies sold than it did back then. The reasons would appear to be twofold. Marvel is more prolific than it was earlier in the last decade, with more of its titles reaching further into the chart. But the 2010 stable of publishers now includes IDW, Boom, and Dynamite, which, together, are moving more copies than earlier equivalent midlisters. In 2003, we were pretty much done with the Marvels and non-kid DC titles by the time you hit the 200s in the chart; it was often Archies and one- or two-title publishers at that point. Today, those publishers often don't make the Top 300 at all. And that's why this is important, because those publishers are still in the market and are still selling comics. They're just not in the charts that are most frequently reported on. Diamond does release a handful of data points below 300th place, a "Small Publishers List"; I include them at the bottom of the Top 300 table each month, but they are not calculated as part of the Top 300 totals. From these comics in September, we can extrapolate that items ranked #301-370 sold about 250,000 copies worth $1 million. That would add 4% to the unit sales for the Top 300, and closer to 5% to the dollar sales (because these lower-ranked comics tend to be more expensive). Back in the days when Capital City ranked everything, we find in one month that the 296 comic books not in the Top 300 only added about 4.8% to the larger total. If just the next 70 comics today are adding 4%, then the Top 300s are capturing a lot less than they used to; the most commonly referred-to aggregates, then, may increasingly be under-reporting Direct Market performance. And it does appear from the overall sales total that the “long tail” for comics did make a difference for the market this month; the Top 300 Comics Plus Top 300 Trade Paperbacks figure captured less of the market in September than it normally does. This does not mean the market isn't struggling — or that many ongoing titles aren't meeting their earlier benchmarks. But whatever the fragmentation of demand means for the industry, it means something specific for the measures we're following: any analysis based only on looking at the Top 300 charts is missing more of the aggregate picture today than it did a few years ago, when the 300th place book bottomed out under 1,000 copies. While the labor involved with preparing these lists makes the prospect of a Top 400 or 500 chart, as we had in the Capital City days, unappealing, I expect that such a list today would show a different picture of overall sales this year. There's more sales volume "bubbling under" than there used to be. At The Comics Chronicles, I do calculate overall totals based on other measures, and looking at the numbers for the first three quarters, it seems clear that the direct market will clear the $400 million mark in overall comics, trade paperback, and magazine orders in 2010. The market will likely perform more poorly than it did in 2009, but the loss is expected to remain in single digits, percentage-wise. The Top 300 Comics and Top 300 Trades lists are off by more — but in this year, they’re not the whole show. The average comic book in Diamond’s Top 300 cost $3.59. The average Top 300 comic book that retailers ordered from Diamond cost $3.57. The median comic book price in Diamond’s Top 300 was $3.99, and $3.99 was also the most common cover price on Diamond’s list. The monthly Flashbacks column is coming soon.